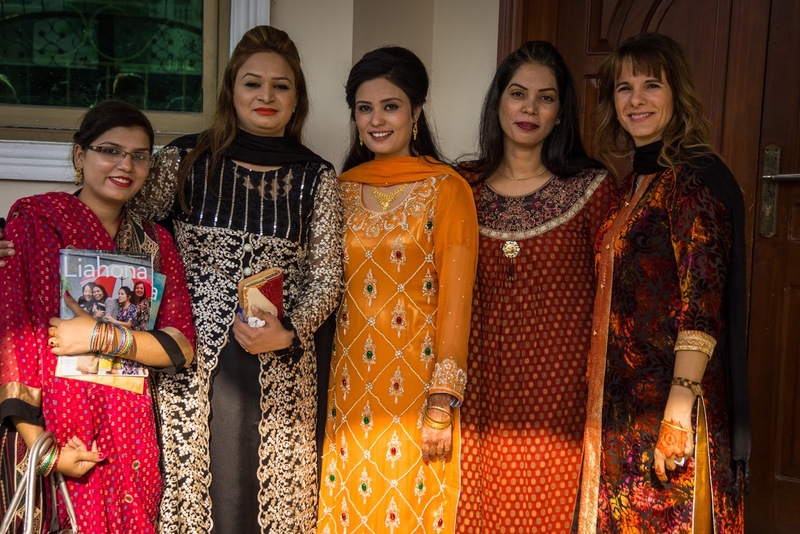 We’re back from the wedding in Pakistan, an adventure aptly called a once-in-a-lifetime experience. It was exciting and uncomfortable and joyful and scary and absolutely incredible every minute. Every day was filled with new things—food, clothing, people, culture. Instead of a precise, day-by-day travelogue which I’m afraid might be boring to anyone but me, I thought I would share with you my top three “firsts” from each day of the trip. 1. First time speaking with a translator. 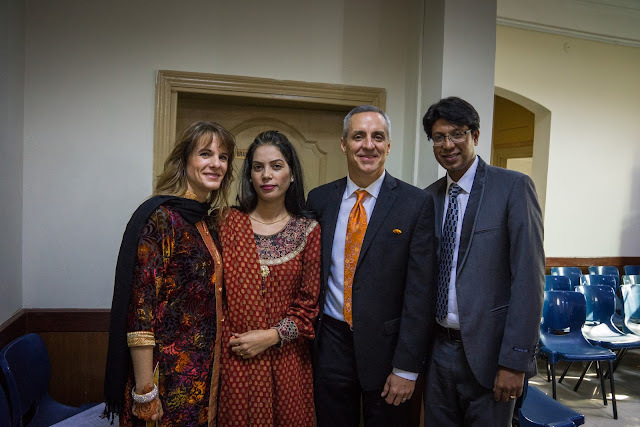 Brad and I were invited to speak in Church in Sialkot, and I’d never given a talk that needed to be translated before. The branch president told us to prepare for 15 minutes each, which I did, but during the sacrament, I realized that was actually twice as long as it needed to be. Rookie mistake, I’m sure. I quickly cut much of it and spoke to the congregation about the American holiday of Thanksgiving and how I counted my Pakistani blessings this year. I wore the shirt and pants made for me by Brother Daniel, and I truly felt beautiful in the velvet that looks like fire. 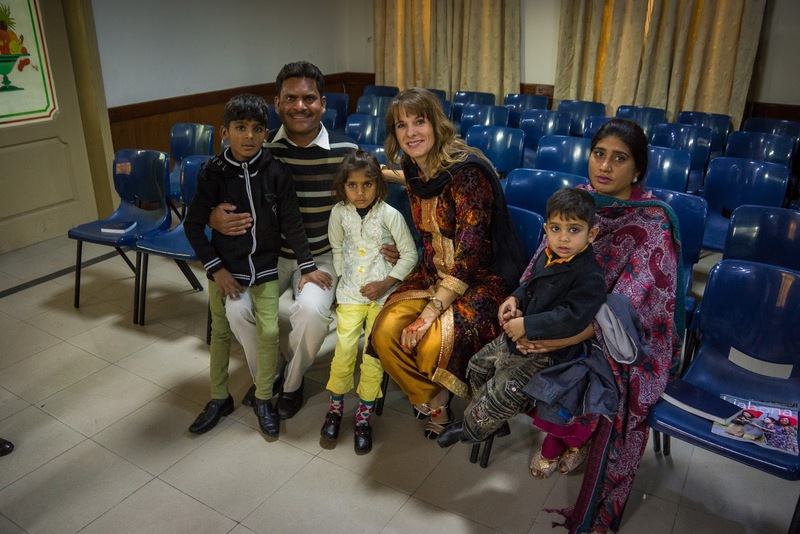 I will never forget the kind, humble, loving, accepting people of the Sialkot branch and their struggles being Christian in a Muslim world. I have deep admiration for their dedication and valiant examples of faith. Three Pakistani missionaries and Brad with Nosheen and Rahat. It was an unofficial orange day at church. 2. First time drinking a Pepsi in a dress shop. Before heading off to the airport in Lahore, we stopped at the Sialkot bazaar with the newly married couple, Junaid, and the Riswan family. The bazaar is insane—the traffic, the noise, the smells, and the people, combined with the visual assault of wares and their sellers from each tiny shop—and I felt like a six-year-old girl, holding hands with Nyla Riswan to avoid getting run over or lost. I wanted to stop at every store and gawk at all the sparkly things, but there just wasn’t time. I was the elephant in the market once again, and this time it was a distinct disadvantage. I wanted to find some fabric for a friend back home, and I had a pretty good idea what I was looking for. Forgetting that Pakistanis negotiate prices on everything, I told the second shopkeeper that the fabric he showed me was “perfect—this is the one.” Dumb. He immediately marked the price up from a reasonable 2000 rupees to 5500, which we refused to pay and he refused to lower. And we walked out. The thing about Pakistani women’s clothing is that each piece is completely unique. If you find what you want, you buy it, because you won’t find that exact thing anywhere else. We continued down the row, but nothing compared to the piece I’d seen earlier. I was getting discouraged until Nyla insisted we enter one of the few shops with a glass door, marking it as a place of quality merchandise. Inside was a Muslim man, dressed head to toe in white, including his hair and beard. Instead of him being either a) dismissive and rude to the Americans or b) greedy and marking his prices up immediately, this man responded to Nyla’s negotiations fairly for a piece I liked. After my first misstep, I avoided getting involved, fearing I would curse this transaction as well. Because I was purposely detached from the situation, I didn’t realize what was going on until a fair price was agreed upon. Then, and only then, did I catch the kind eye of the shopkeeper. Before my trip to Pakistan, I had ideas of what Muslim men would be like. 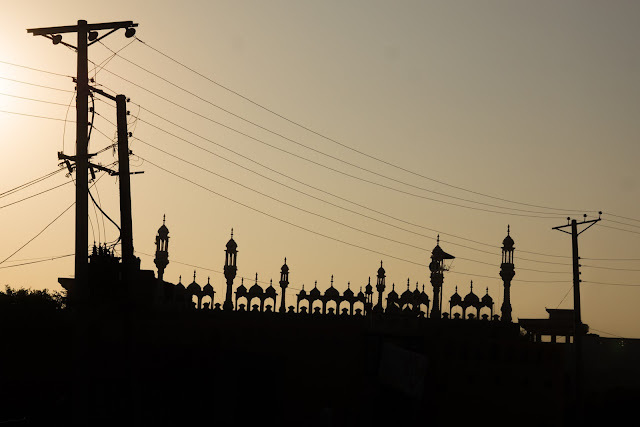 I’m a product of a culture that has been taught to fear them all as potential terrorist, but I was concluding a week being among them and living as a Pakistani, and my experience had been much different than I thought it would be. The shopkeeper then surprised us all. Through Nosheen’s translation, I realized he wanted to invite us for a drink in his shop with him—that he would consider it an honor to drink with us. Even though we were in a hurry to drive the three hours to Lahore and even though we could not exchange more words than “Thank you,” we laughed and drank Pepsi from glass bottles with a straw with this Muslim shopkeeper and his assistant. Brad was so surprised by his offer to drink together that we walked out of the shop with our bag, and Brad forgot to pay him, even though he had counted out the money. We continued down the market for at least ten minutes before the shopkeeper caught up to us on his motorcycle, not angry at all that the transaction had not been completed. Embarrassed, we walked directly back to his shop to give him his money. As we left, he bowed, smiled, and said “Thank you.” This was most of my experience in Pakistan—not one that the world ever sees, but I want to be sure the world knows is real. 3. First time eating dinner in a restaurant past midnight. Pakistani traffic cannot be explained; it has to be experienced. Our drive from Sialkot to the airport in Lahore at 11 pm was riddles with traffic, bad directions, and getting lost. Add in the fact that we had four enormous suitcases, two backpacks, three packages, and seven people smashed into a car about the size of a smaller American small SUV. It was so tight and uncomfortable and lasted over three hours. But, as Brad and I said many times over this week, “That’s Pakistan.” We had allotted plenty of time to get to the airport and stop for dinner at a restaurant where Riswan’s nephew works. Repeated calls to Lahore Chatkhara, the restaurant, still didn’t get us there before they were supposed to close at 11:30 pm. But because we were Americans, they stayed open to feed us. This was Pakistani food at its very best. Wow. The naan (native bread) was perfectly crispy on the outside and soft inside. The food was delicious. The staff, required to stay at work over an hour past their closing time was extremely polite and accommodating. And the final surprise? They comped our entire meal. I know the odds are really, really, really slim, but if you ever find yourself in Lahore, eat there. It was some of the best food I’ve eaten in the entire world, and I’m not just saying that. I rarely stay up late. Every night in Pakistan was late, squeezing weeks’ worth of adventures into the hours of a few days. On this night, we didn’t leave the restaurant until almost 1 am, uncomfortably full but ready for our final flights home. Total travel time was just under 50 hours, including 8.5 hours of layovers and waiting. It was long. It was tiring. 1. First time I held my husband’s hand in public. Affection in Pakistan is not demonstrated at all in public between married couples (or even in front of family). As Brad and I walked to our final gate in LA, I said, “Guess what I can do?” and I slipped my hand comfortably into his. And then, for good measure, I gave him a quick kiss, right on the mouth. Just because I could. 2. First meal. While the food in Pakistan was good, we missed American food. Our first meal? Burgers and fries, of course. And they were GOOD! 3. First time in jeans. Strangely enough, this felt a little immodest and uncovered to me when I first put them on in the bathroom. Weird, right? Since I’ve lived that way my whole life. It didn’t take me long to assimilate back to my beloved boots, though. And after almost 50 hours of travel, what were the first things I did when I got home? As incredible, memorable, and life changing as this trip was, there really is no place like home.